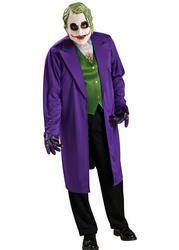 Size Choose Size M/L Up to 44"XL Up To 46"
The Joker made his first appearance back in the first Batman comic book back in the 1940s and ever since has been a hugely popular choice for fancy dress costume. Heath Ledgers portrayal of the character in the Dark Knight film further cemented the characters popularity thanks to his quirky and frightening take on the classic comic book character. 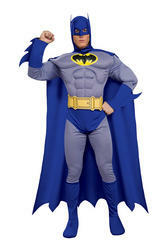 You too can re create the iconic look with this fabulous officially licensed fancy dress costume that contains everything for turning you into the scariest villain to ever roam the streets of Gotham City. The costume comprises of a long purple jacket, a printed T shirt featuring shirt, tie and vest detailing and is completed with a realistic looking Joker mask . Perfect for any fancy dress party thanks to the now iconic status of the Joker but especially popular for Halloween thanks to the creepy look of the costume.